Your micropigmentation experience should not be a painful one. Use of the most powerful rotary device on the market, and the proper use of anaesthetic will make your treatment more pleasant. We strive to provide a comfortable experience, and we do so by numbing the areas very carefully, thus discomfort during the treatment is minimal. The prices listed are per session. Consultations are free of charge. 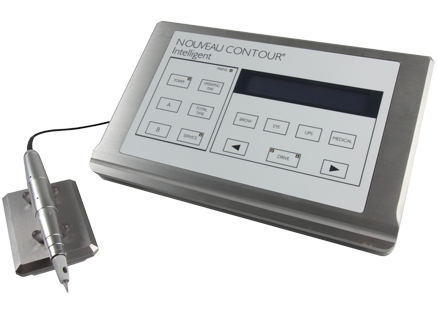 We offer the most advanced, medical grade, German-made micropigmentation device – the Nouveau Contour Intelligent computerized device. Its precision and pigment deposit are remarkable. It features pre-programmed settings for eyebrow, eye liner, and lip color, with needle speeds and pressure automatically set for optimal pigment deposit. In addition, the handpiece constantly measures resistance of the skin during the procedure and automatically adjusts the needle frequency and pressure to allow for consistent pigmentation, leading to a better final result. In addition to best pigment deposit, the device will cause minimal trauma to the skin, as all needle punctures are consistent regardless of the skin thickness. For more information about Nouveau Contour Intelligent, please visit the manufacturer's website. While this device will give a phenomenal pigment retention, the pigment retention will vary from person to person, and often the skin absorbs pigment differently even in the same area in one individual. Therefore, it will be necessary in most cases to do a follow-up session after 4-6 weeks. Please note that this second session is included in the initial treatment price. Should more touch-up sessions be required, please note that the touch-up prices will apply. We can do our best to optimize your result but cannot guarantee it due to person-to-person variation. Our no-package approach means that you do not have to pay upfront for a number of treatments, and instead have the freedom to pay for individual treatments as you go. This is more affordable and gives clients more flexibility in choosing the kinds of services they wish to have performed each time. Feel free to call us if you would like to book an appointment or if you have any questions. Consultations are free of charge. Please note that we have a 24-hour appointment cancellation policy. Unit 406 @ 73 Richmond Street W.
Exit subway on Queen Street. Walk west towards Bay Street, then south towards Richmond Street. Turn west again on Richmond Street and walk until you see the 73 Graphics Arts Building. We recommend parking at the Old City Hall west of Queen St. & Bay St.
Street-level parking is available on corner of Victoria St. & Richmond Street W.